The message that i wanted to give from my poster is that all women come together as one and no matter what are races, we should be able to express our feelings as women. When I was writing the words We All Stand Together, I chose to make the word Her in together White to make it stand out and i would make the rest of the words still black. I decided to make the backround gradient using blue and purple because I like how the backround made the words and picture stand out. The font was bold because I like how it got my message out. So I was going to start out with a sunburst effect and have the same quote in the middle. But then i worked a couple days on taking pictures with Natalia and Santashia for my second poster and I thought that my message looked better if i had this picture of us. 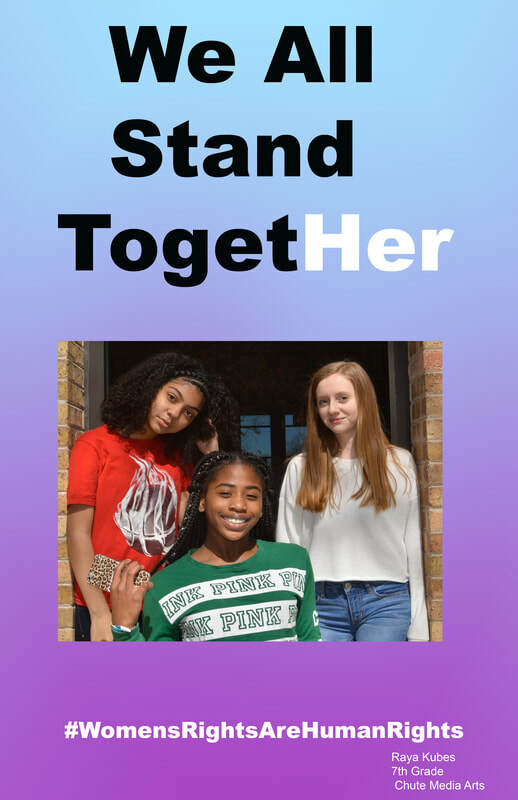 I feel as though the picture is the best part of my poster because there are three women of all different races and we stand together in this picture to show no matter what race all women come together and show how we feel. So this picture that is here on the left is the picture that I had taken of my dog a while ago. I knew when I wanted to cut this picture that I really wanted to have a lot of detail in his fur because that is one of his best features. This is what I want my lazer cut to look like. I selected different parts of my dog and first rasterized my layer then I used the threshold tool, this tool makes your picture black and white to be able to get this picture ready to be cut. This is what my first cut looks like I knew that I wanted the details to be darker than the light wood background, but I don't like the way it turned out. The burn color is too dark for my liking. You cant really see any of the details that I wanted my dog to get cut out like. So now i'm going to reprint my cut and i'm going to be making my burn color lighter so you can actually see the details and i'm going to be selecting different sections and rasterize my layer. Then I will be using thresh hold tool to make the details stand out even more on the actual cut. ​ This is my second lazer cut. I like how the details on the right side of the cut showed up but I wish that the details in the fur, face and left side showed up because the details looked quite different when I was looking at my image that I used the threshold. Im not sure I like what this cut looks like on wood, so i'm going to try it out and see if I can print it on acrylic. This is how my second try looks after I selected the layer and rasterized it and then used the threshold tool. I liked how the details were shown in the fur in black and white. Our plan is that we are going to be using gummy bears and we will be using the instrumental of the “New Freezer” song and we will be switching off beats by tapping the different gummy bears. So we have changed our plan and now its going to be a space theme using the "Plug Walk" instrumental by copper tape attached on fish line that will be holding Clay planets. Today we started putting our beats in to sound trap and scratch and we were watching tutorials to help us. So today we made different planets because we will be spray painting a box like outerspace and we also have an alien and these will be our conductive items for our project. This is our box that we will be attaching our planets that we created with clay and our alien that we created, we will be attaching the planets by wrapping string in copper tape to make the makey makey create music. So right now we have our box almost complete with the makey makey that is being connected to the planets we made with clay and it was attached with fish line wrapped in copper tape because the copper tape is what we are using as the conductive item to make our song "Plug Walk" when we touch the planets or copper tape.